I'm feeling a tired and lazy tonight after spending the my first day back in the office today after the Christmas/New Year break, therefore I've just got one swatch to share with you. 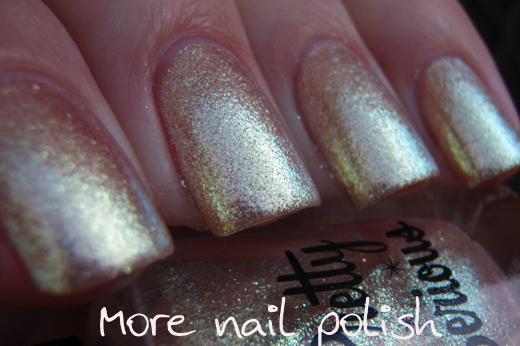 I wore this before Christmas, which is when I fell in love with it and it made my top polishes for the year. Pretty Serious Mummy Mush is from the Monster Mash collection and it's a golden glass fleck polish that it totally unlike any other I have seen. The base colour is actually quite pink. When I swatched it onto my swatch sticks I was amazed at how pink the base was, especially when holding the stick up to the light. However as soon as you layer two or three coats, that pink disappears and ends up providing a soft fleshy coloured gold. The gold flecks are just how I like them, cool toned (and it even has a blue flash), yet the pink base warms it up just slightly. 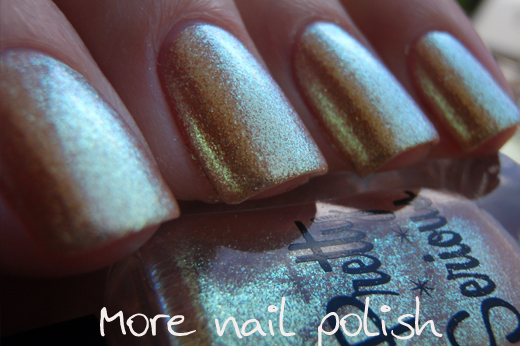 I'm completely in love with this polish, if your a gold lover like me - this one is a no brainer! This is three coats of Mummy Mush with a single coat of Seche Vite. When I first bought this it reminded me of Christmas Beetles. It's a gorgeous polish I have worn it quite a few times recently.